February is often rainy, though 2015 is thus far the exception. One of the more pleasant activities this time of year is admiring the early-blooming trees and shrubs. Our ‘Ray Hartman’ Ceanothus is usually glorious in February. And our Arctostaphylos densiflora ‘Howard McMinn’ is a perennial favorite with humans and pollinators alike. Vine Hill manzanita is endemic to a relatively small area of Sonoma County, 13 miles from the Northern California coast. It grows in the Vine Hill area, between the towns of Forestville and Sebastopol, in a part of Sonoma County best known for its vineyards. The region is mostly forest, with openings (‘barrens’) featuring unusual sandy clay, acidic soils. The Vine Hill manzanita grows in these barrens, as do several other endangered plant species: the Vine Hill ceanothus (Ceanothus foliosus var. vineatus) and Vine Hill clarkia (Clarkia imbricata). 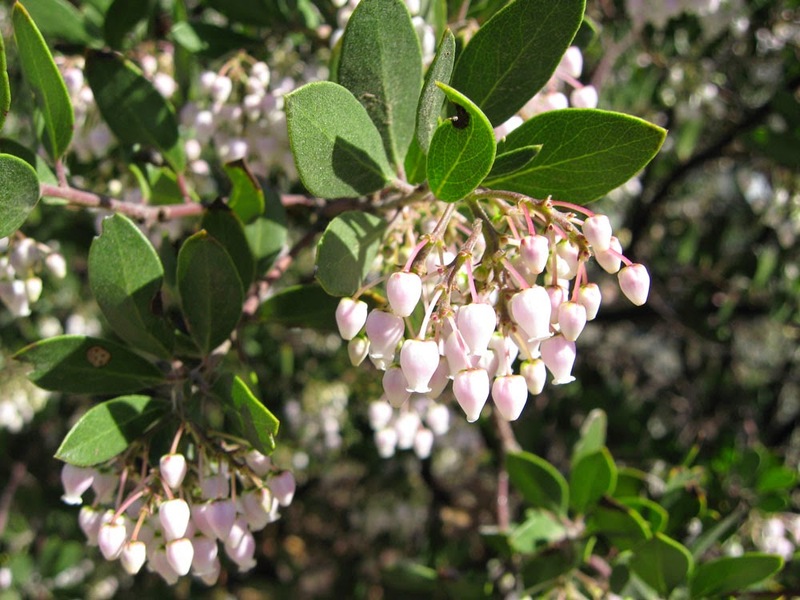 The species Arctostaphylos densiflora is now limited to a small number of individuals growing in or near the Vine Hill Preserve. It is listed on the California Native Plant Societies Inventory of Rare and Endangered Plants as a category 1B.1 species (rare, threatened, or endangered in CA and elsewhere). But several cultivars of this amazing manzanita are alive and thriving in gardens throughout California. In fact, they are some of the best known – and garden-proven – of the California manzanitas. We are fortunate to have one in Mother Nature’s Backyard. The ‘Arctostaphylos densiflora cultivars’ are likely actually hybrids between the Vine Hill manzanita and other California Arctostaphylos species. As discussed in the Van Soelen article, the parentage of several common cultivars, including ‘Harmony’, ‘Howard McMinn’ and ‘Sentinel’, is hidden in history. 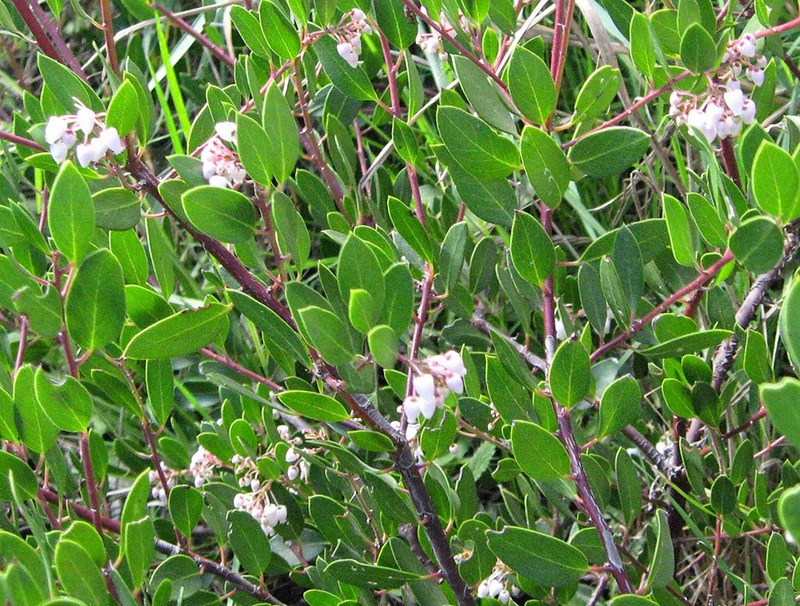 These cultivars arose in the wilds or in gardens which either contained (or were within pollinator’s flight distance) of other manzanita species. Since manzanitas hybridize given the opportunity, our garden favorites are likely hybrids. Only DNA studies may someday reveal their true parentage; as far as we know, such studies have not yet been done. Interestingly, the common ‘Arctostaphylos densiflora cultivars’ share several distinctive characteristics of their Vine Hill parent. All have rather small (for manzanita) pinkish flowers in dense clusters (truly ‘densiflora’). Their leaves are almost perpendicular to the ground, giving the plants a neat, dense appearance compared to other manzanitas. Most tend to grow wider than tall – at least in the first several decades. And they tolerate a wide range of soil textures from quite sandy to clay. 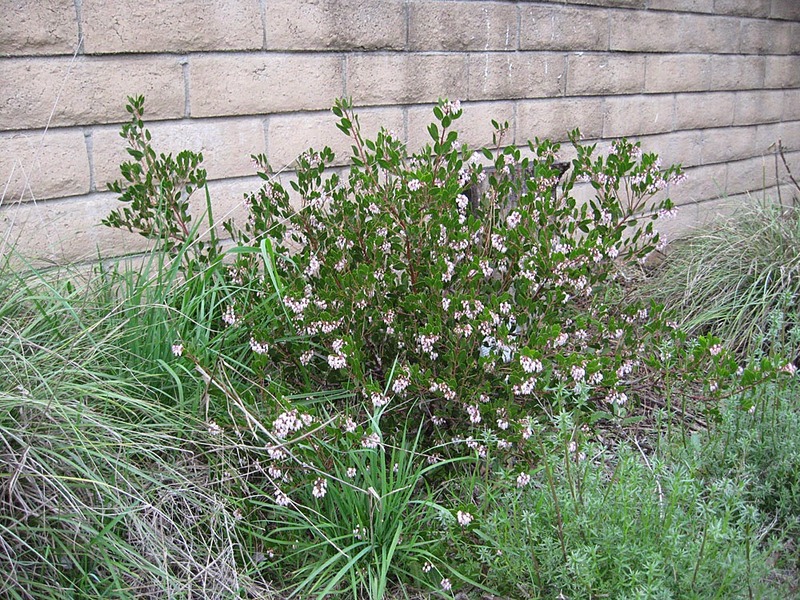 ‘Harmony’ manzanita grows 2-4 ft tall and 4-6 ft wide in its first decade or so; it is often used as a woody groundcover or low foundation plant in soils ranging from sandy to clay. But it has the potential to grow to 6-7 ft. tall and about as wide; it can be pruned up over time to reveal its attractive trunk structure and bark. ‘Harmony’ is said to most resemble A. densiflora; it has larger leaves and a more open habit than the other ‘densiflora’ cultivars. It can take very wet soils in winter and very dry ones in summer. Arctostaphylos ‘Sentinel’, another popular cultivar, is taller (to 8-10 ft with time) and more upright (4-6 ft wide) than the other A. densiflora cultivars. It also grows more quickly than the rest. A natural hybrid (most likely) from the Vine Hill area, it is more drought and sun tolerant than the other cultivars, though not as frost hardy. It is often pruned up as a small, multi-trunk ‘tree’ to exhibit its red-brown bark. This cultivar has slightly grayer leaves and looks wonderful combined with greener manzanitas, including ‘Howard McMinn’. 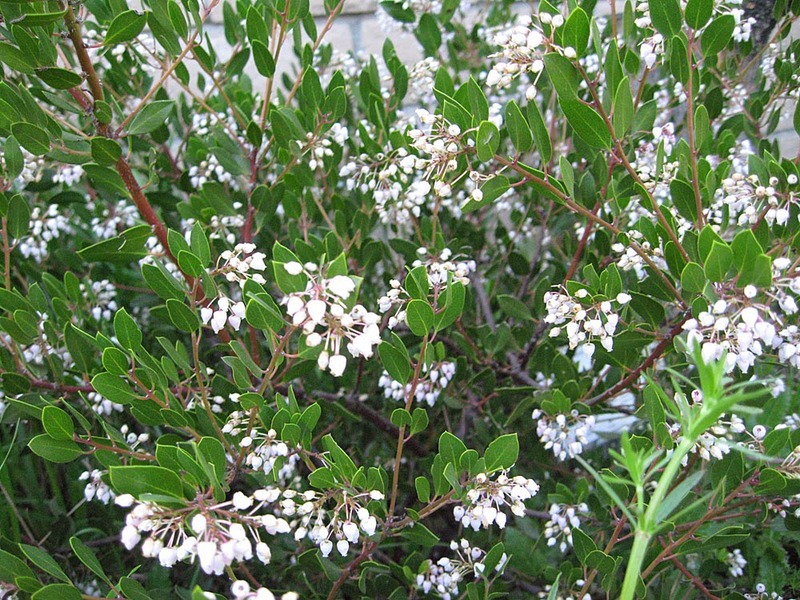 ‘White Lanterns’ manzanita is a very dense shrub growing eventually to 5-7 ft tall by 8-12 ft wide. Similar in appearance to ‘Howard McMinn’, it has smaller leaves giving it more fine appearing texture and denser foliage. It was introduced by the Santa Barbara Botanic Garden from a volunteer seedling selected by Dara Emery. It makes a lovely specimen, foundation plant or informal hedge. 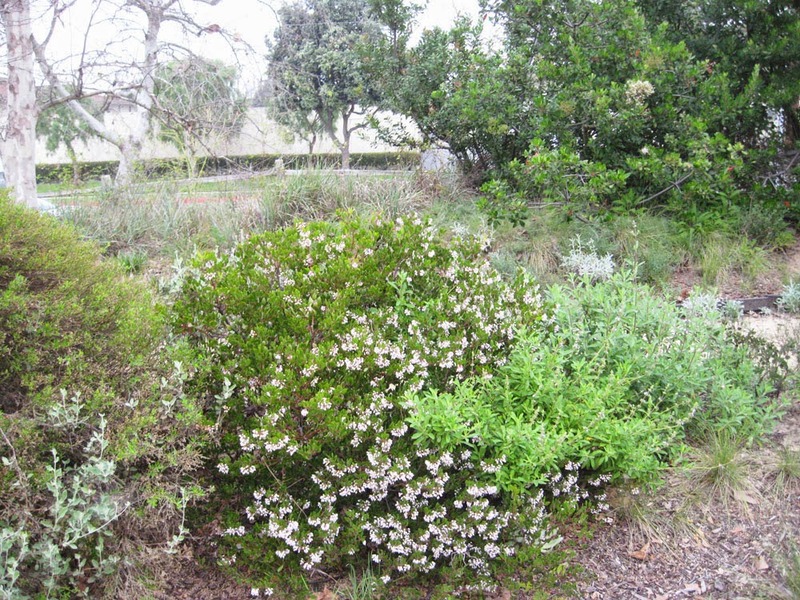 Like all Vine Hill cultivars, it is literally covered in white flowers in late winter/early spring. Arctostaphylos ‘Howard McMinn’ is probably the best-known and most widely available of the A. densiflora cultivars. It was selected by Howard McMinn, botany professor at Mills College, from the college garden (Oakland), where he raised manzanitas from seed collected at Vine Hill and other sites. It is speculated to be a hybrid between Arctostaphylos densiflora and perhaps A. stanfordiana. 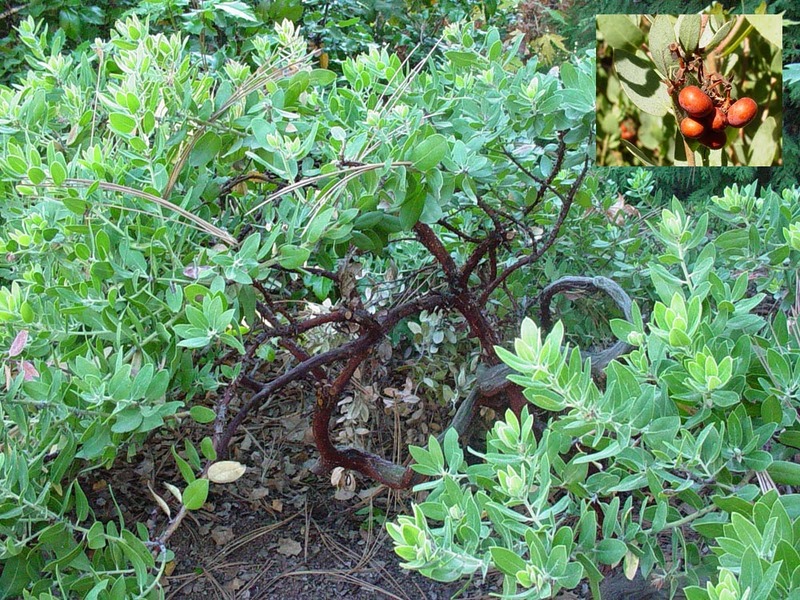 ‘Howard McMinn’ manzanita was introduced into the nursery trade by the Saratoga Horticultural Foundation in 1955; it received the ‘Award of Merit’ from the California Horticultural Society in 1956. So it is relatively old by California native cultivar standards. There are garden specimens more than 50 years old - still growing strong! We hope our plant at Mother Nature’s Backyard will do as well. 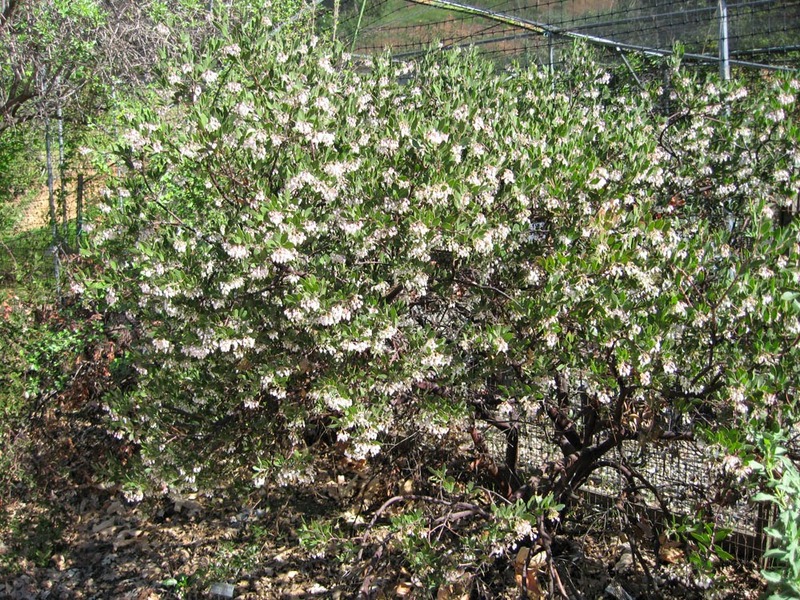 ‘Howard McMinn’ manzanita is a slow-growing, bushy shrub. 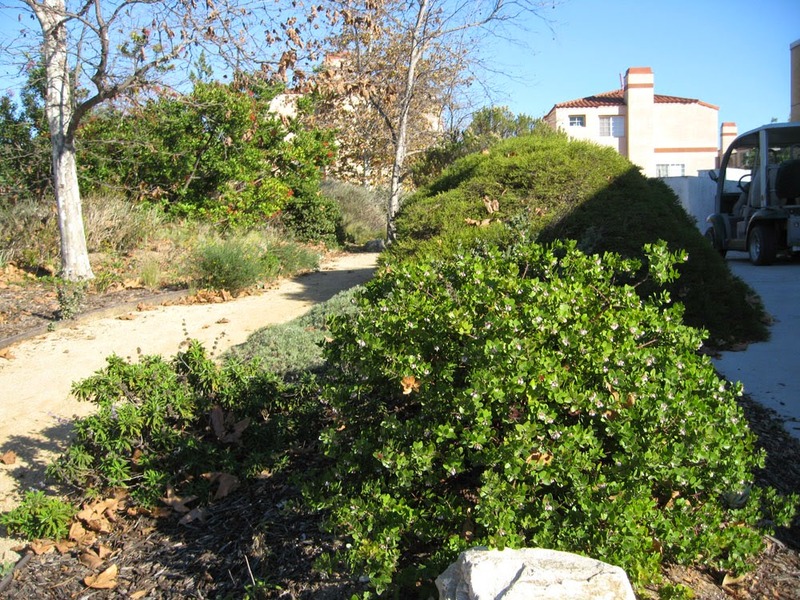 It was originally described as a smaller manzanita, suitable as a groundcover; garden experience has shown it can become rather large with time, ultimately attaining heights of 6-10 ft and widths of 6-12 feet. But its slow growth will keep it a medium shrub (4-5 ft tall; 5-6 wide) for many years. ‘Howard McMinn’ has a dense, medium-green appearance due to its erect leaves (see below). Gardeners often choose manzanitas for their evergreen leaves and red-brown bark. This cultivar displays both from an early age. In fact, from a foliage standpoint, ‘Howard McMinn’ has to be one of the prettiest manzanitas available. Like most manzanitas, ‘Howard McMinn’ has a nice natural shape: mounded and dense when young, more open at the base with age. Some gardeners like to thin out lower branches to encourage a tree-like shape. But little pruning is required – just removing dead branches is all that’s really needed. We like to let manzanitas take their own shape over time. Of course the main attraction this time of year is the flowers. True to its parentage, ‘Howard McMinn’ manzanita puts on quite a show! This year the flowers were only around for several weeks, probably due to the hot weather. In a usual year in western Los Angeles County, this cultivar is covered with flowers for 3-4 weeks from as early as late January until well into February. 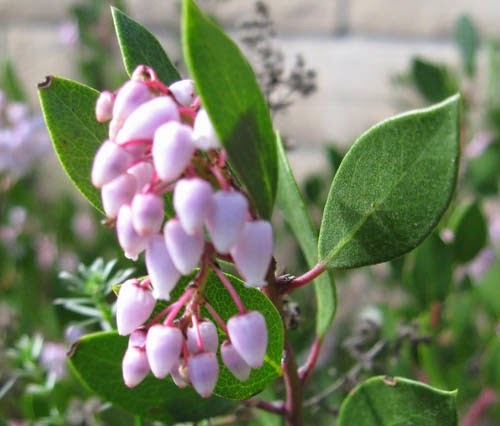 The flowers are small and urn-shaped – typical for manzanita – and range from pink to almost white. They are held in rather dense clusters, mostly on the sunny exterior of the foliage. The flowers are noticeably smaller than those of our Bigberry manzanita (see: http://mother-natures-backyard.blogspot.com/2014/01/plant-of-month-january-bigberry.html) making them accessible to European honey bees as well as the longer-tongued native bees and hummingbirds. On a sunny day, plants are literally buzzing with pollinators. The fruits of ‘Howard McMinn’ manzanita are the ‘little apples’ of manzanita fame. They usually ripen to red-brown in late spring/early summer in our area. The fruits are edible and can be made into a refreshing cider-like drink (more on that this summer). They can be used to make tasty jellies or syrups; they can also be dried, crushed and used for a pleasant tea. Of course the fruit-eating birds like Northern Mockingbirds, Scrub Jays and Cedar Waxwings will happily devour any left-over fruits. Birds are also known to nest in mature manzanitas. ‘Howard McMinn’ is more forgiving than most manzanitas when it comes to garden conditions. It can take full sun near the coast, but does better with some afternoon shade in most local gardens. It loves well-drained sandy soils, but does fine in clay loams and clays (especially if planted on a low berm). Quite drought tolerant once established, ‘Howard McMinn’ is more tolerant than most manzanitas of a little summer water. But don’t over-water – once a month should be plenty. 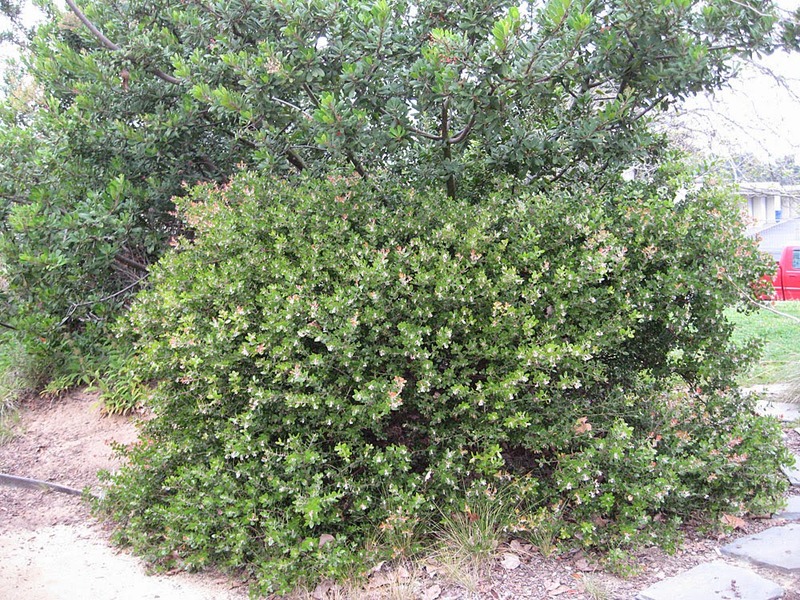 Use ‘Howard McMinn’ as a specimen shrub in the front or backyard. It’s pretty enough to stand muster in the most manicured of neighborhoods. It also makes a nice hedge or hedgerow plant. Its size is perfect for hiding a block wall (as we are doing in Mother Nature’s Backyard). 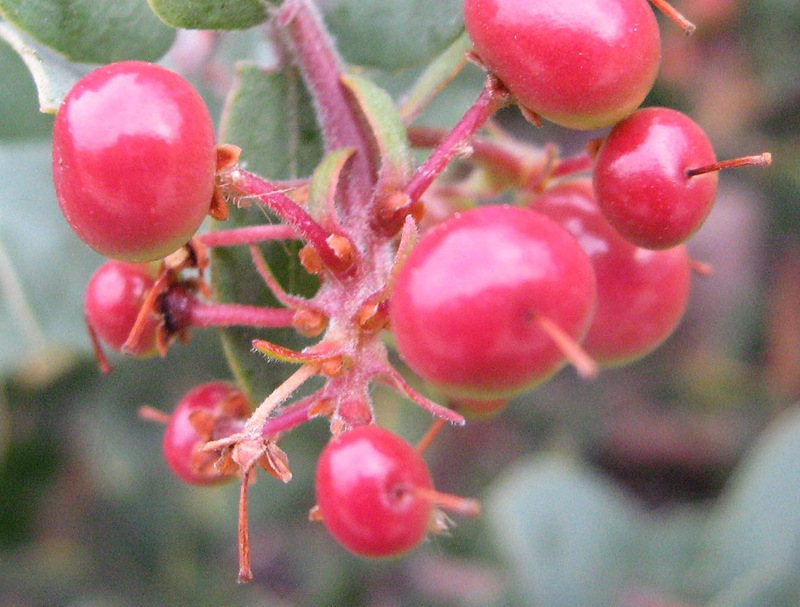 ‘Howard McMinn’ is often used with manzanitas/cultivars that have different growth or foliage characteristics. The year-round green contrasts are soothing, and the yearly show of flowers and fruits is magical. It does well on slopes, making an easy-care slope cover. Some even advocate it as a candidate for a large container. However you use it, Arctostaphylos ‘Howard McMinn’ (and the other Arctostaphylos densiflora cultivars) make great additions to the garden. They are time proven and should last a lifetime with proper care. 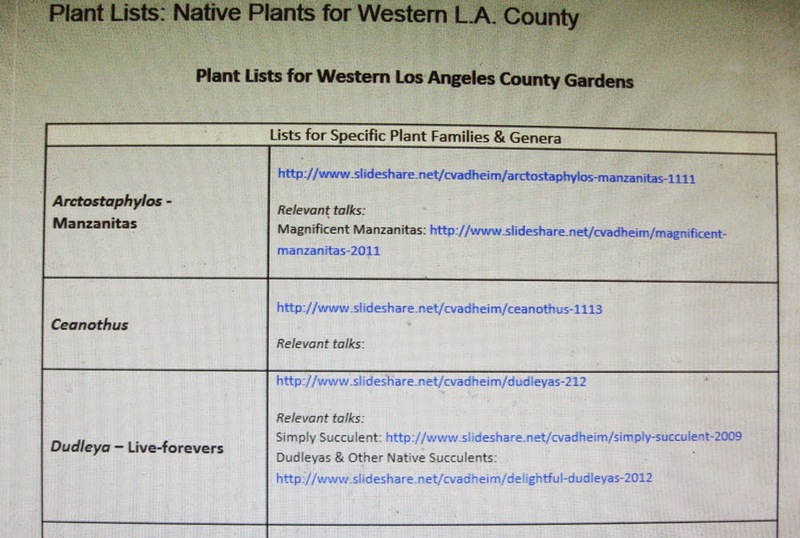 We've made the Gallery of Native Plants even better by adding links to relevant talks to our popular 'Lists of Native Plants for Western L.A. County Gardens'. Check it out at: http://nativeplantscsudh.blogspot.com/p/plant-lists-native-plants-for-western.html (or access using the Gallery page (right).